In my previous article “Situational reflex: the key to martial effectiveness” I discussed the need for martial artists to develop “situational reflexes” – ie. appropriate reflexive reactions for the potential situations we might face. To do this, I think the first (and most pressing) issue is to identify the situations that we are likely to encounter. These include what Patrick McCarthy has described as “Habitual Acts of Physical Violence”. However a martial artist might also want to include other, less common, situations – whether for civilian defence, for use in the ring or on a mat, or simply in dojo sparring. Once we have isolated the relevant situations, the next step is to identify any “situational reflex blind spots”, other deficiencies that we wish to rectify or tactics upon which we want to improve. For example, in my article “Dealing with circular attacks” I recounted how a Traditional Fighting Arts Forum member, Emero, was seeking to find a way to deal with his master’s circular kicks in the dojo. Okay, so let us assume that we’ve isolated a particular situation for which we want to develop a particular reflex. How do we go about this? The most obvious way is to set up a facsimile of the situation and run through it repeatedly until the reflex is ingrained. This is commonly known as a drill. So a tennis player will stay at the net while his or her coach will hit balls towards the player for forehand and backhand ground strokes alternating between these either sequentially or at random. Ditto with volleys, overhead smashes, top spin lobs, etc. The drills contain a limited set of movements, but those movements occur in a “dynamic context” - in other words, they occur in an environment where there is continual movement by one or both parties. And, most importantly, this movement is faithful to what happens in an unscripted environment - at least in principle. So there is an initial stimulus (the ball being hit over the net), a set-up move by the player responding to the stimulus (eg. a lunge or step together, with a wind up or positioning of the racquet), and a response (eg. a volley, baseline stroke or smash). The drills repeat this dynamic context frequently and rapidly, preferably running one dynamic context seamlessly into another (again, in a manner that is faithful, at least in principle, to what happens in an unscripted environment). The principal reason for this is to maximize the number of times the player is exposed to the situation - and is forced to react successfully to it. The more times the player reacts successfully to the situation, the greater the chance that the successful reaction will emerge reflexively in an unscripted environment. A secondary reason for having one dynamic context rolling into another is a little more subtle and relates to how the brain inculcates reflexes, as opposed to logical thought. I’m talking here about the need to set up a rhythm. If you look at any drill designed for pragmatic inculcation of reflexes, you will find rhythm. When it comes to reflex development, rhythm trumps earnestness, enthusiasm, “realism”, intensity - whatever else you want. For example, you can earnestly and diligently practise tennis ground strokes with maximum force and concentration. But if you pause and “reset” between each groundstroke (as you might between serves), it won’t do you much good in developing situational reflex for baseline play. Good groundstrokes require you to read play in a much wider context than what you get with a “standing start” serve. Specifically, they require you to read the game in the context of its rhythm – which, in the case of baseline tennis play, is clearly discernible. Similarly, the goal of any other drill is to enable pattern recognition in the wider context of its activity – and match your reaction to the rhythm of that activity. And this needs to happen subliminally. The conscious mind learns through analysis. The subconscious mind learns through rhythm. It recognizes a familiar rhythm and matches your reflex to it. It is for this reason that I said the set-up moves comprising the dynamic context must be “faithful to what happens in an unscripted environment - at least in principle”. What I largely meant was “at least in rhythm”. Because, often enough, an effective drill need have none of the urgency or intensity of the unscripted situation. The drill can occur at a slower rate and will typically occur in the absence of any panic or stress. But this doesn’t really matter; so long as the rhythm is the same, the reflex will be adopted. Put another way (and continuing with the musical analogy), you can inculcate the right reflex despite different tempos and different emotional input - provided the time signature remains the same. Because it is the recognition of the patterns that counts. The tempo and intensity of the patterns are largely irrelevant to the process of pattern recognition. It is important to note here that when confronted with a sudden threat, people don’t startle or flinch “slowly”. They do so as fast, and with as much gusto, as their body will allow! This isn’t something that needs to be learned - it is innate. The exact form of movement also needn't have perfect fidelity; movements can be larger (as is frequently the case with kata) or more complete than they would have in a real confrontation (real-life movements tend to become abbreviated or have less than "ideal" form). As with tempo and intensity, necessary abbreviation is something that the brain handles automatically. For example, if your drill has you moving in deep, formal stances, you aren't in danger of defaulting to such formal stances under the pressure of real combat. Rather, a kind of "law of entropy" operates, where you are continually being drawn to the lines of least resistance and greatest ease. I've never, in all my 31 years of training, ever seen someone default to a deeper stance than is necessary. It always goes the other way. Once a pattern has been recognized, and an appropriate reflex to that pattern has been inculcated, the body can and will adjust the tempo and intensity of your reflex appropriately, as it will take the edges off any "strict form", whenever the pattern is recognized in an unscripted environment. These are things that happen subconsciously. I have previously discussed my school’s use of slow to medium speed sparring in a flowing, rhythmical environment (what we call “randori”). I’ve compared this to how dogs “playfight”. 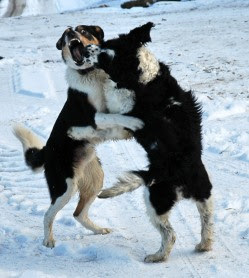 You’ll notice that when dogs playfight, they move at about ¾ speed in a constant flow of movement, while controlling their bites so that neither is injured. This is the only “practice” they get at fighting. And yet we all know darn well that when they really fight, they won’t default to this ¾ speed nor control their bites! Instead their subconscious will ramp up both the speed and the intensity appropriately. So what is it dogs are doing when they playfight? They are instinctively setting up a natural flow - a rhythm - appropriate for pattern recognition and inculcation of reflexive responses. It is apposite to note that dogs never “ramp up intensity” of these playfights to short, sharp, disjointed exchanges that are “intended to mimic the real thing”. Rather, they settle into a sprawling, medium-paced flow - a flow that is faithful to the rhythm of movement in a real dog fight, albeit at a (much) slower speed and without any of the intensity that would accompany a real dogfight. Instinctively, dogs (and other predatory mammals such as cats) use this method of fight preparation instead of any other. Their behaviour has been naturally selected to inculcate reflexes for attacking (whether in fighting or hunting) and dealing with attacks (whether from other predators or even a defence by their prey). Natural selection tells us that this method of preparation is very likely optimal for inculcating a productive reflexive fighting response in animals. Coming back to Emero, how can he set up a “facsimile” of his sparring encounters? As I discuss in my article “Boards don’t hit back”, particularly in Part 2, the problem with fighting is that you have so many more variables than you do in a ball sport: First, you’re not dealing with a single point of focus such as a ball. You don’t have a limited number of possible strokes using a racquet. The movement of the ball and your racquet does not occur along a limited set of trajectories. Rather, you’re dealing with virtually unlimited possibilities in movement, at any angle, using any part of the body. Fighting is chaos. By contrast, a game like tennis is, on a universal scale, relatively ordered and predictable. Accordingly, setting up a “facsimile” of human fighting is going to be a tall order. I’ve already suggested that one might adopt a “free-fighting” method like the flowing ¾ speed playfighting of dogs - and indeed our school uses this in its “randori” sparring method. But as I’ve detailed in my articles “Boards don’t hit back” Part 1, and Part 2, sparring doesn’t so much teach you tactical approaches as it does test them. We martial artists still want to isolate specific, optimal responses and inculcate them so that they occur reflexively in certain situations. In particular, Emero would like to isolate and inculcate a particular defence to a spinning kick. If all he does is spar, he won’t have a ready means of achieving this goal. Yes, he will (sooner or later) manage to deal with one or two spinning kicks correctly. But this is hardly a scientific way of approaching the issue. So while dogs might playfight, they aren’t exactly adapted to think more deeply about their tactics and adopt a planned means of improving them. We humans are. We need more than playfighting. We need dedicated, instructional and reflex-grooving drills. We can modify our “playfighting” so that we can focus more specifically on those skills that we seek to acquire. Accordingly what we need to develop appropriate situational reflexes are drills; drills that set up the relevant situation in a dynamic context. That dynamic context must reflect the natural rhythm of the situation as it occurs in an unscripted setting. More than anything, the dynamic context needs to afford us oft-repeated opportunities to recognize the patterns of the relevant situation - and respond appropriately. Once we have done sufficient repetitions of the drill (commonly said to be around the 10,000 mark) our brains will have connected the patterns of that situation with the response – and made the response reflex.